Want Love in the Time of Taksim? "A heart warming love story in the midst of a people's uprising. 600 people from 97 countries, under the leadership of Al Gore; all committed to fight against climate change find themselves in the center of another fight... What you hope for does not necessarily happen, but then life has other surprises and you may find love at an unexpected time & place..."
"We delve into the emerging genre of 'cli-fi' in order to escape the global climate horrors starting now. Gabriela Sosa's work intertwines real climate projections, real social conflict and a real love story into one. Her novel is a harbinger of what may come, the real climate chaos down the road, so let's stop it now while we can and celebrate love." 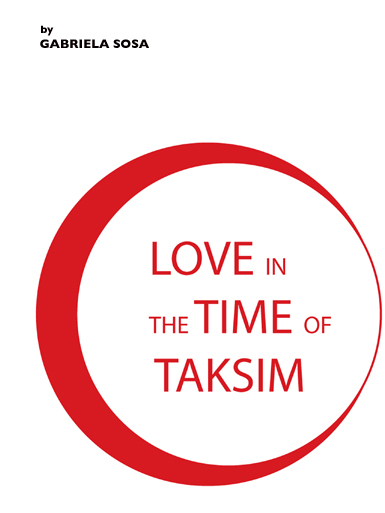 Love in the Time of Taksim is a must read for for those interested in current events, romance, religion, different cultures, travel and climate change. Gabriela managed to merge all these topics into a fun, quick read that leaves the reader better informed and wanting more. As a teacher and comedienne, I recommend it to those teaching young adults about politics and to people who love to laugh out loud while reading. History and social upheaval has never been so entertaining! I want Book II - what happens between Marcela & Ercan? Gabriela Sosa, former diplomat of the Republic of Panama, transitioned to the realm of mass media, hoping to bring the topic of climate change to a bigger audience. She has been living in Los Angeles for the last 13 years, where she has worked as a newscaster for Univision’s KMEX, a radio producer for Radio Express, and an independent producer, earning herself an Emmy in Field Production for the Oscar-nominated documentary film, “Which Way Home.” Currently, Gabriela has become a Climate Leader and volunteers with the Citizens Climate Lobby, Organizing for Action against Climate Change and Tree People, among others. She has written multiple screenplays, plays, musicals, radio shows, news reports and speeches, and starred in several films and theater productions. Gabriela is also a guest blogger featured on Vélo Vogue. If you ever happened to need an interpreter at the Federal or State Courts of California, you may have run into her. She has studied 11 languages and loves to travel, cook and garden, as well as to practice martial arts. Gabriela’s ongoing project is called “My EcoVillage,” a TV and online show, highlighting ecovillages and sustainable living across the globe. She hopes to build an ecovillage and live in one in Panama someday. Copyright © Gabriela Sosa 2013. All Rights Reserved.